Frank: Many Christmases ago, I went to buy a doll for my son. I reached for the last one they had but so did another man. As I rained blows upon him, I realized there HAD TO BE ANOTHER WAY. Frank: It was destroyed, but out of that a new holiday was born A FESTIVUS FOR THE REST OF US! After watching the recently released complete series of Seinfeld on Hulu followed by watching the complete series of Curb Your Enthusiasm on HBO Now, this has been the Summer of Seinfeld en mi casita. The Festivus episode is one of the most memorable moments of the series and is actually based on an actual holiday created by the father of one of the show's writers. I simply can't get enough of Jerry Seinfeld and Larry David's humor and observations. 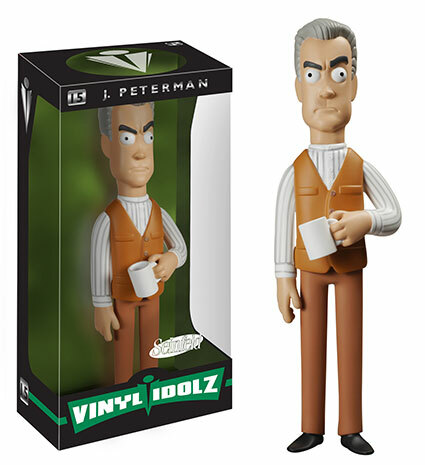 Check out the Seinfeld action figures (missed opportunity for a Festivus call back by calling them dolls) via Vinyl Sugar. Serenity Now! I admittedly have never played Risk, but I've always wanted to try my hand at the board game. Now that Risk has unleashed a Game of Thrones edition upon us, I REALLY want to try to play it. The game includes 2 game boards (Westeros and Essos), 315 Army Pieces (representing House Stark, Baratheon, Lannister, Martell, Tyrell, Targaryen & Ghiscari), and has just about everything** you need to conquer the iron throne and find out if Lannisters always pay their debts. Extra points if you play it in a walk-in freezer or outside during a snow storm. Check out the HBO store to purchase and for more info. I enjoy listening to people talk in just about every way of the form, but especially in conversations. I ask a million questions just to listen to what people have to say(to the point where it's probably somewhat annoying at times). Listening to a good conversation is just as good as being involved in one for me. Comedians In Cars Getting Coffee is the best and purest form of celebrity conversation I think I've seen so far. I'm a bit biased considering I already enjoy Seinfeld's humor, but I thoroughly enjoy listening to what always seems like good friends talking about the subjects they're talking about without having to put on a face for the camera (as in not having to put on a performance). If you have an Apple TV at home, you can check out the show via the Crackle App for free also. If you're new to the show, a few episodes I recommend to get the ball rolling are: Louis CK, Larry David, and David Letterman. Comic fan or not, Daredevil is Legitimus Prime. Now available on Netflix for a very worthy bing-watching session, Daredevil is the origin story of an iconic Marvel comic superhero. A blind lawyer from Hell's Kitchen, fighting crime in the courtroom and on the rooftops/alleyways. Just like any other show, I recommend going a few episodes deep before truly making up your mind on investing your time for the long haul. Trust me, once Vincent D'Onofrio steps into the dynamic everything changes. Well it did for me. D'Onofrio seriously flexes his awkward and assertive character in the way really only he can. Very reminiscent of his prior villainous roles (The Cell, MIB). The things I really like about this show are how they show how tiring it must be to fight in hand to hand combat. Daredevil isn't a Norse god or inside of a mechanical suit so his endurance being drained is something they show and I LOVE that. The fight scenes are truly great, the grittiness of the show(MA rating), and the depth in which they portray the main villain are something I hope all comic book films/shows emulate from now on. Is it a perfect show? No, but it's definitely a big step in the right direction. Well if you haven't figured it out by now, I'm sharing my list of shows that I watch with you. There's a lot, and I mean A LOT, of crap on TV right now and this show, my friends, is just the opposite. Smart, witty, and quick are the first adjectives that come to mind when I describe it to mi amigos. I wouldn't say it's for everyone, but you should give it a shot. Sherlock stars Benedict (I'm pretty sure he's an alien) Cumberbatch (Imitation Game, 12 Years a Slave, Jungle Book) and Martin Freedman (The Hobbit, Fargo The Series), the episodes are all available on Netflix. Don't worry, there are only three episodes per season. - If you're already a fan of the show, I highly recommend Unlocking Sherlock on Netflix. It's a bit of the making of the show. Breaking Bad is done. Sons of Anarchy is over. The Walking Dead's season finale just aired. Now what? If you're looking for another series to jump into (or binge-watch), may I recommend Peaky Blinders. Personally, I feel like it's a better show that SOA and really holds it's own against the likes of a Breaking Bad (although there's just no replacing Bryan Cranston, the rest of the BB cast really dragged the show down... I'm looking directly at you Anna Gunn). Peaky Blinders is a crime drama based on a post WWI Birmingham, England street gang by the same name. The story itself is sort of in the same vein as SOA and BB, wherein a family member takes it upon himself to lift his family(and the family business) to the next level... by any means necessary. Cillian Murphy (Sunshine, Inception, 28 Days Later) stars as the lead character in the show alongside Sam Neill (Jurassic Park) and Tom Hardy (in season 2). Tom Hardy (Inception, Bronson, The Dark Knight Rises) has some serious acting chops and is a pretty hot commodity right now, so for him to grab up a role in the show tells you a bit about the caliber and potential of Peaky Blinders. Seasons one and two are available on Netflix right now. Already up to date on Peaky Blinders? Then may I recommend Netflix's Bloodline. Now, of course these are all appetizers for when the main course gets here and now that HBO Now is about to launch, we can all get our Game of Thrones Fix(which happens to be the best show on TV, hands down). Done watching HBO's The Jinx and waiting for the next season of Game of Thrones to start? Well if you already ran through House of Cards' newest season, do yourself a favor and search for Bloodline. It's the latest and greatest from Netflix. Check out the trailer for the breakdown. Another Binge-worthy show from Netflix's pretty solid lineup. The first thing I noticed about the show was the caliber of production, pretty legit. You can tell right off the bat that this isn't just another crap TV drama. I recommend sticking around giving it a shot. I'm on episode 11 and it has yet to disappoint. The Culebra vampire take on Mayan/Aztec serpent worshipping, disguised as a cartel is pretty genius. Thanks for making that into a show Señor Rodriguez and El Rey Network. I had an idea for something that, in my opinion, would be an interesting concept to introduce into this already awesome show. The introduction of Jaguar Warriors and Zapatistas, who happen to be one and the same.